What Time Does Floyd Mayweather Fight Miguel Cotto (UK)? Wondering what time the fight starts tonight? Read on. There's a pretty special fight going on tonight - Floyd Mayweather steps up to 154 to fight Miguel Cotto. With the fight being held in Las Vegas, there's is going to be a time lag for us UK boxing fans. I know what a pain it can be working out the time zones etc, so we've done it for you. There is a full undercard on offer with some great fights that, to be honest, are worth watching even on their own. Take Shane Mosley vs Saul Alvarez for instance - that's a main event by anyone's standards. So, the full coverage kicks off at 9pm ET, which in the UK will be 2AM. 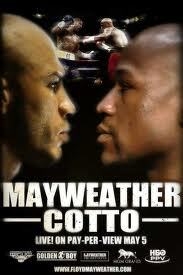 With all the fights going on, you can expect Floyd Mayweather and Miguel Cotto to be in the ring around 4-5am. Go and have a nap at midnight and you'll be fresh for one of the greatest fight cards of the year.